How to start sharing content to blogs and social media (autoposting)? To automate content sharing to blogs and social media accounts in RSS Ground you create posting campaigns. To set up a posting campaign you need to select content feeds first. The same way you add new public content feeds, new private feeds or converted datafeeds to a posting campaign. 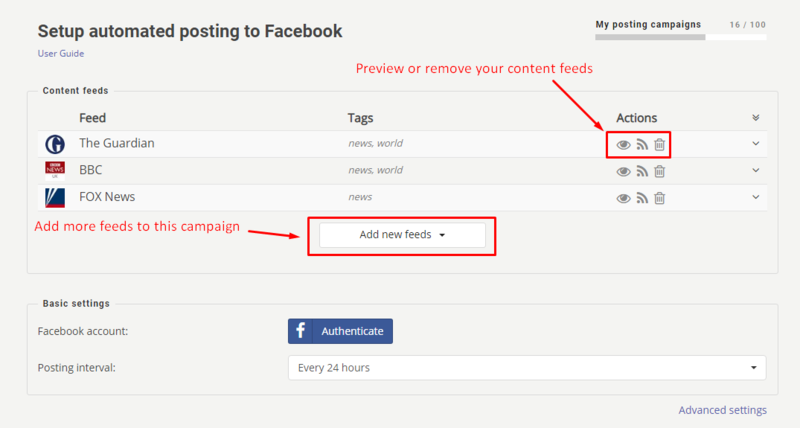 But you have an option to add your feeds to a new or already existing posting campaign. 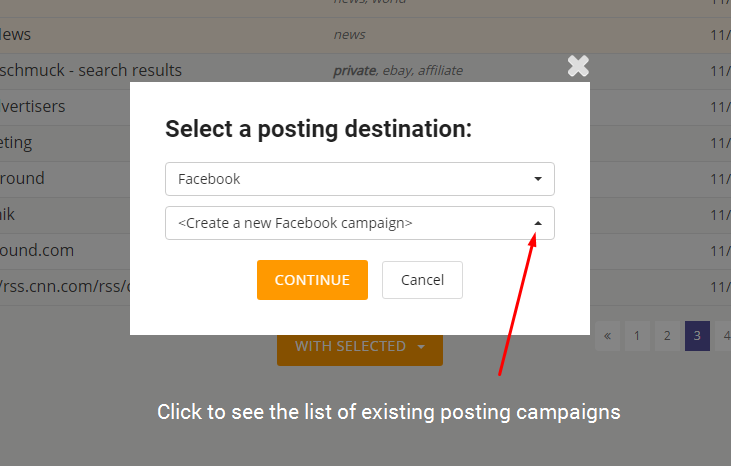 When you click Add to a Posting Campaign option you will be offered to choose your posting destination and a name of one of existing posting campaigns, as well as an option to create a new posting campaign. You can use up to 10 content feeds in one posting campaigns. If you wish to post content from more feeds to the same blog or social media page you have to create another posting campaign. Let's see an example of a Facebook posting campaign. When you set up or edit your posting campaign first thing you set up is a list of your content feeds. You can always preview, remove or replace content feeds in your posting campaigns. But remembers, as soon as you remove your content feeds from your Feeds Box, they are automatically removed from all posting campaigns. Be careful. After feeds are done, you go on with other campaign settings. Each posting campaign editor has Basic and Advanced settings. In Basic settings, you authenticate your posting destination and specify posting interval. Advanced settings will perfect your posting settings. The detailed explanation of all Advanced settings you will find in individual user manuals for each posting destination. All posting campaigns require only Basic settings, Advanced settings are optional. In Basic settings, you Authenticate your personal social media profile or your blog. As soon as it is authenticated, you select a specific page, group or category to send posts to. In Basic settings you also set up a posting interval. Here you suggest how often you would like to send updates to your page or blog. Depending on your membership level you can set to make posts as often as every 30 minutes. 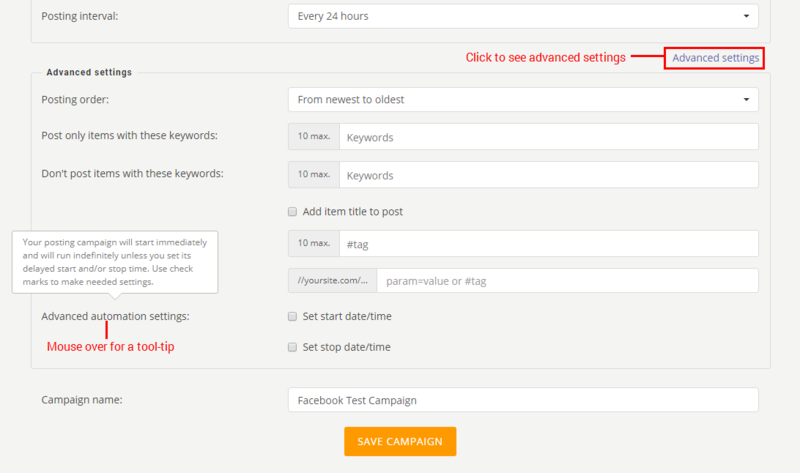 All your campaigns will run continuously until you manually stop them or set a stop date. According to a posting interval setting your content feeds will be check for available content. If there is no proper content no post will be made and the campaign will stand by till the next posting time. Note: we recommend using posting intervals which closely simulate human behavior to avoid bans and penalties from social media platforms. Every 3 or 6 hours should be often enough. 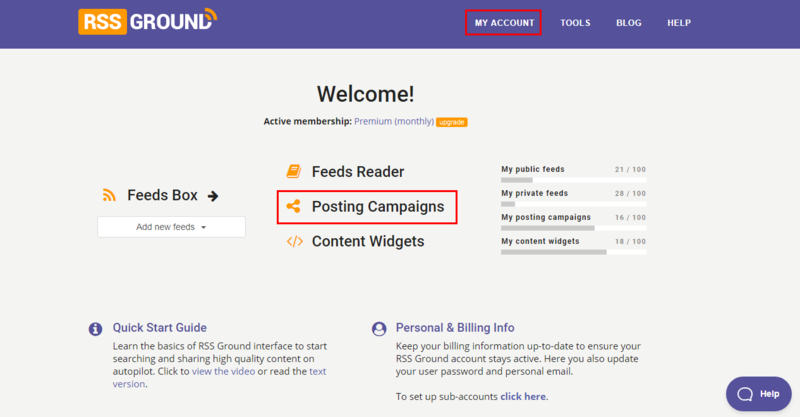 You can always connect any other user or blog to your posting campaign. Press "Disconnect" and authenticate user profile or blog you want. To make Advanced settings press appropriate link under Basic settings section. The number of advanced settings can be different depending on a posting destination. You can read about advanced setting in separate user manuals, and for a quick hint mouse over any option label for a tool-tip. Your last step is to name your posting campaign and press SAVE CAMPAIGN. Your posting campaign will start running right away if not a specific time was set in Advanced settings. You will be able to see your first post within minutes. Next posts will appear on your pages or blogs according to your posting interval and posting settings. 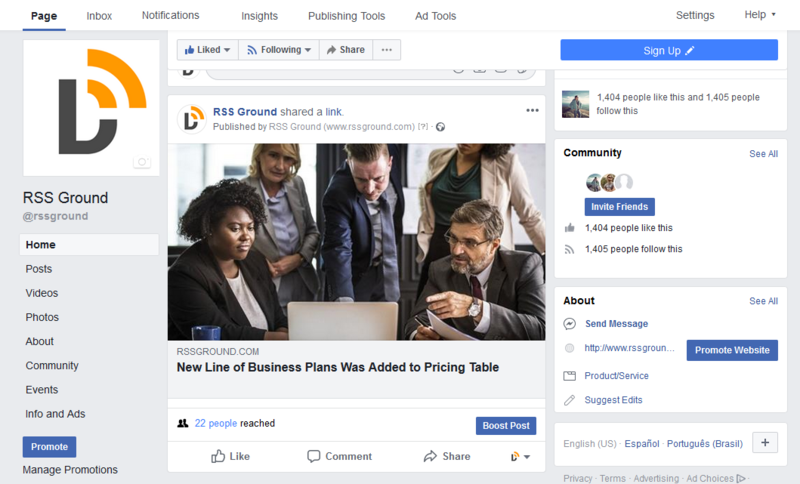 If no new posts appear at a designated time, most likely, no fresh content was found in your feeds, and your campaign skips a turn, waiting for relevant content to appear. You can always access your existing posting campaigns from MY ACCOUNT page. Click on Posting Campaigns link to see all campaigns. In case you have any questions, please refer to our comprehensive Knowledgebase. Or you can search for support materials and contact our support team using help beacon, which is located in the lower right corner of each service page. Well, hope this was useful and informative. Now you can easily supercharge your posting and sharing activities. Enjoy and have fun! 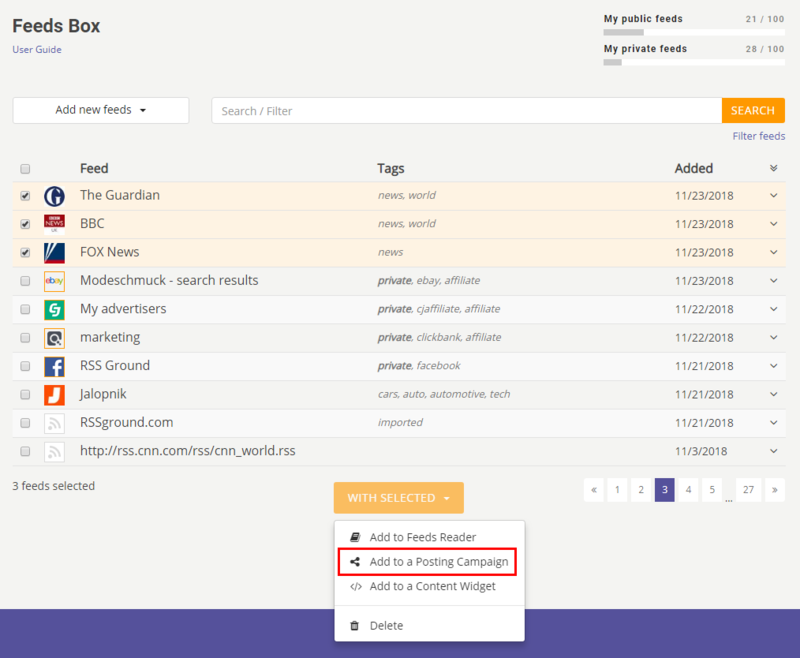 How to manage content feeds in Feeds Box?